A tour at the end of the month offers Seoulites the chance to get away from the city and immerse themselves in Korea’s ceramic traditions. 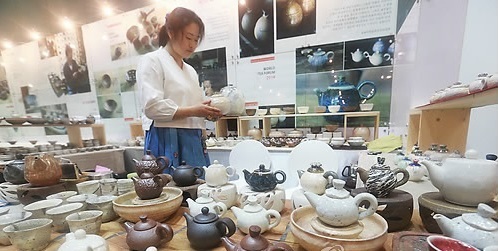 The Royal Asiatic Society is organizing a trip to the annual Tea Bowl Festival held in the fortress town of Mungyeong, North Gyeongsang Province, to celebrate Korea’s ceramic heritage and tea culture. Potters from Korea and overseas gather for a massive exhibition in the folk village at the base of the fortress, and the RASKB tour, the folk village and the festival. Participants will also get to try their hand at some pottery creation. The excursion will include a walk along the fortress, which guards the northern edge of the Sobaek Mountains on the road to Seoul from Busan. The trip runs on April 29 from 8:30 a.m. to 6 p.m. including travel time from Seoul. The price varies with the number of participants. See raskb.com for more information and reservations.